It’s almost that time of year again when Apple puts together some of the biggest names in the music business for our listening pleasure. Apple’s annual iTunes Festival will make a reappearance next month with a solid lineup consisting of some of the biggest musical superstars currently operating today. 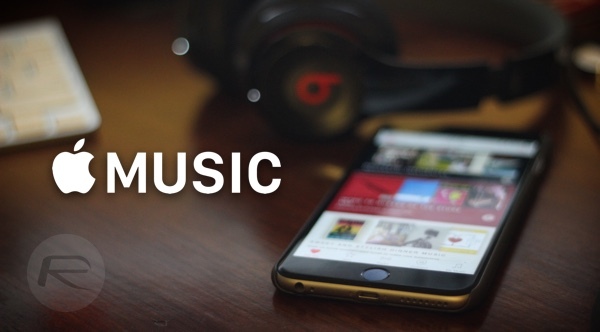 The format and structure of the musical festival will remain consistent with previous years, with the exception of one big change; Apple has renamed it as the Apple Music Festival in homage to the recently launched Apple Music streaming service. Apple’s official press release for the festival not only outlines some of the talent that will be headlining the festival, but also confirms that the gig itself will be taking place over a period of ten nights from the 19th to the 28th of September. Pharrell Williams, One Direction, Florence + The Machine, and Disclosure will be amongst many other currently popular music superstars, who will be showcasing their talent at The Roundhouse in London. Eddy Cue, Apple’s Senior Vice President of Internet Software and Services, confirms that his company is trying to make this the best festival yet. We wanted to do something really special for music fans this year. The Apple Music Festival is a greatest hits set of ten unbelievable nights featuring some of the best performers on the planet appearing live and interacting directly with their fans on Connect and Beats 1. 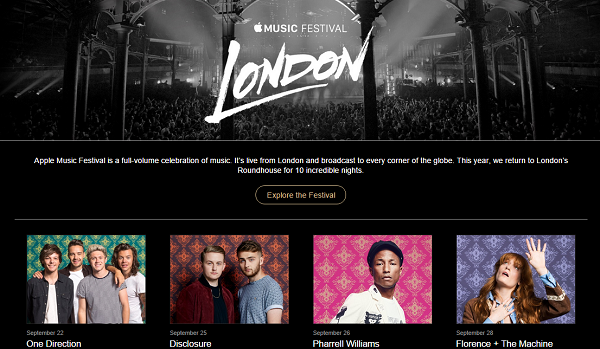 As you might expect, the rebranding of the iTunes Festival to the Apple Music Festival also brings with it some serious Connect tie-ins with the company’s revamped Music app and streaming service. The entire ten days of festivities will be broadcasted around the world for free as usual, except that this time around it will be also be accessible live and on-demand from within the Apple Music app; a “single, intuitive app that combines the best ways to enjoy music – all in one place”. Apple is clearly taking advantage of any opportunity to promote and market its Apple Music streaming service and app. The festival originally spanned for a good 30 days, but after having trimmed it down to just 10 days, Apple is allowing users to tune directly into the Beats 1 radio station for accessing live coverage of whoever is dominating the stage at that particular time. The Apple Music app will also have a dedicated Apple Music Festival page within the Connect section of the application which will allow fans unprecedented access to artists and other related content. While admission to the festival is totally free, it remains exclusive to U.K. residents only, who will still need a valid ticket for entering the venue. Tickets can be won by applying to a draw contest held through the Apple Music app. For additional passes, be on the lookout for promotions and offers being made by media partners such as the London Evening Standard for a chance to win free passes. The site I have already been using for ՍΝᏞΟᏟΚing my phones is just google atttiphoneuunloockiing. If you want a trusted սոⅼοсking, you can purchase their services.